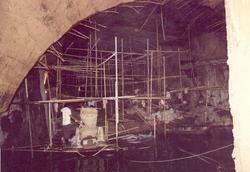 Repair work inside rock tunnel after dewatering at Srisailam Left Bank Hydro Electric Station, India. 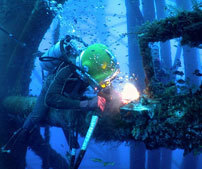 - Underwater ship repair and maintenance including hull cleaning and leak repairs. - Inspection and troubleshooting of underwater fittings like echosounder, ICCP anode, Sonar, EM log and electrodes . - Photo & Video graphy of underwater hull. - Wet welding of structural damage. - Underwater cleaning of hull for marine fouling. - Inspection and survey of hull, propellers, hull fouling, stabilizers and paint condition.